WOKING’S Holiday Inn is currently undergoing a huge multi-million pound transformation. 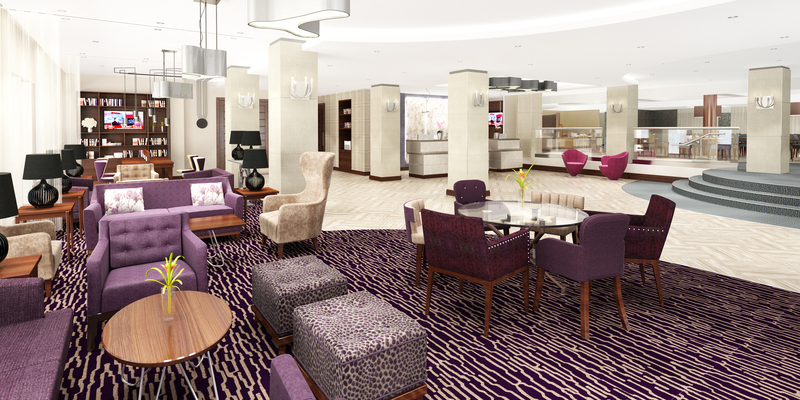 The hotel will relaunch as the luxurious new four-star DoubleTree by Hilton, Woking, in September 2015. DoubleTree by Hilton is a recognised brand under Hilton’s Culture of Care. Features will include a Hilton HHonors floor offering contemporary, stylish accommodation with stunning views, a large modern conference and events centre, a state-of-the-art gym and a magnificent new reception and lounge area. The new bar and restaurant will be an ideal place to relax, unwind and enjoy great wines and taste locally sourced ingredients. General Manager Peadar McFadden said: “The ren-ovation will be key in elevating the hotel to the next level of luxury, and we look forward to attracting new business and leisure guests to Woking. It will make a great central hub for companies, as we will be able to accommodate meetings for up to 300 people. All guest rooms will be of a high standard in décor and comfort, and will have lap-top safes, blackout curtains, heated mirrors and much more. They will also have built-in USB ports at spacious workstations and by the bedsides, and 32in HD Tvs, while complementary WiFi will be available throughout the complex. A Deluxe room will offer the ultimate in luxury with a spacious, lavish environment, an additional seating area, minibars, 48in HD TV, espresso machine, alarm-clock radios and complimentary refreshments. Holiday Inn Woking employ many resident staff and are currently looking to recruit more team members who can demonstrate great customer skills. Anyone interested in joining the team should apply to hr@dtwoking.com.